Bayfield County, Wisconsin - found between Bule River State Forest, Copper Falls State Park and Chequamegon National Forest in the northwestern part of Wisconsin just south of Lake Superior. Bayfield is more of a wooded getaway with... Types of WI Trout & Salmon - Inland & Great Lake Trout Types; Rainbow Trout, Brown Trout, Brook Trout. Great Lake Salmon – Chinook Salmon, Coho Salmon, Steelhead & Lake Trout. Brown Cty - is located between Sturgeon Bay and Appleton on the Eastern Middle part of the state. Brown is more of a Green Bay Packers Territory... 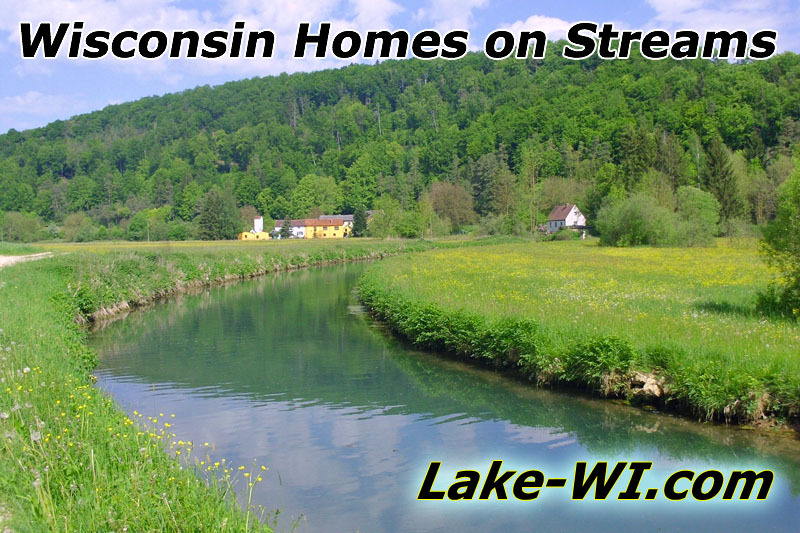 Enjoy Wisconsin Waterfront Real Estate! Grant Co - can be found between Prairie Du Chien and Dubuque, IA on the south western part of the state with along both the Wisconsin River and the mighty Mississippi River. Grant is known its hills, valleys, streams, bluffs... Trout Stream Property! Green Lake Cty - is located between Montello and Ripon in the south central part of the state with the Fox River flowing through it. Green Lake is known its cross-country skiing ... Types of WI Trout & Salmon - Inland & Great Lake Trout Types; Rainbow Trout, Brown Trout, Brook Trout. Great Lake Salmon – Chinook Salmon, Coho Salmon, Steelhead & Lake Trout. Kenosha Cty - s located between Lake Geneva and Lake Michigan in the most south eastern county in the state along the Illinois border. Kenosha is known for Great Lake frontage... Types of Streams - Stream, Brook, Creek, River, Runnel, Tributary, Branch, Channel and Run. Menominee Cty, Wisconsin - is located between Antigo and Shawano in the north eastern part of the state with the Wolf River flowing through it. Menominee is known for its 95% of wooded land, hunting, public land, rafting, golfing, sturgeon... Creekfront Properties! Monroe Co - is located between La Crosse and Mauston in the west middle part of the state with the La Crosse River flowing through it. Monroe is known for cranberry farming, cows, lakes, wildlife, rock formations, Sparta 400 bike trail... Common WI Fish - Largemouth Bass, Smallmouth Bass, Musky Muskellunge, Northern Pike, Panfish, Flathead Catfish, Channel Catfish, Walleye, Bluegill, Perch, Black Crappie, White Crappie, Lake Sturgeon, Shovelnose Sturgeon, Pumpkinseed, White Bass, Rock Bass, Drum, Sauger, Bullheads, Salmon, Trout, Warmouth, Sunfish and Steelhead. Richland Cty - is located between Viroqua and Reedsburg in the south western part of the state along Wisconsin River which forms the whole southern border. Richland is known for its wooded rolling terrain, farming culture ... Channel Frontage! Shawano County - is located between Wausau and Green Bay on the eastern middle part of the state with the Wolf River winding through it. Shawano is known for its recreation trails, golfing, ATVing, ... Stream Frontage Houses for Sale! Pond ownership may not be for everyone. Considerations may include cost, maintenance, lifestyle or location. But, for many, owning a pond may be the best thing on earth. It can be wonderful having a tranquil waterfront property and interacting with nature. Watching wildlife in a peaceful picture perfect setting. Maybe having a picnic or drinking your morning coffee. What can be better than fishing or swimming or even ice skating in the winter. You will want to consider also the source of having a natural organic protein supply at your back door. whatever the reason for purchasing a home with a pond, you can start right here. Taylor Co - is located between Lady Smith and Wausau on the north western central part of the state with the Jump River flowing through it. Taylor is known for its fishing, hunting, wildlife, bird watching,... On this site you can search for Waterfront Property, Creek Frontage, Stream Frontage, Channel Frontage, Streamfront Homes, Creekfront Cottages, Creekfront Cabins, Streamfront Log Homes, Channelfront Cabins, Waterfront Houses, Boat Docks, Private Piers, Trout Streams, Creekfront, Channel Homes, Creek Homes, Stream Homes and more... located in this county, listed by a real estate agents. Vilas County - by between Rhinelander and Upper Peninsula of Michigan on the northern middle part of the state along the Michigan border. Vilas is known for its 1,300+... Creekfront Opportunities! Vernon Co - is located between Minnesota and Reedsburg on the western middle part of the state along the Mississippi River just south of La Crosse. Vernon is known for its canoeing... Wildlife Stream Properties for Sale! Winnebago Cty, WI - by Appleton and Fond Du Lac in the central eastern part of the state with Lake Winnebago forming almost the whole eastern border. Winnebago is known for its arts, culture, festivals, historical sites, music... Wisconsin Waterfront Properties!